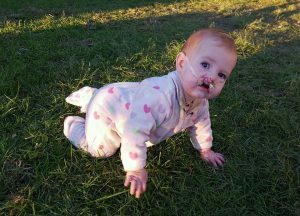 This is Jacinta, she was born with a bilateral cleft lip, gum and palate. Jacinta’s mum Sandy was told it would be impossible to breastfeed. Sandy expected Jacinta to be taken straight to special care after her birth, but instead she was left with her mum. After hearing her baby cry and cry, Sandy did exactly what she had done with her four previous babies – she put Jacinta to her breast. And what do you know? Jacinta breastfed! Although Sandy needed to express-feed Jacinta, she put her to the breast every time she expressed for the next 13 weeks of her life. Please see below a video of Jacinta’s very first breastfeed. Jacinta is now 9 months old, and is due to have lip repair surgery this week. Although Jacinta is no longer breastfed, every breastfeed that she had matters. Every breastfeed ANY baby receives is important, but especially for a cleft-affected baby, who may require surgery down the track. 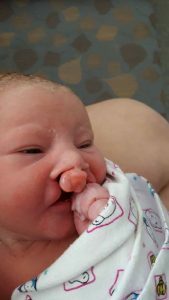 Surgery means exposure to extra nasty nasties, and the immunological boost received from breastfeeds, particularly her first breastfeeds, will help protect Jacinta. Even if exclusive breastfeeding is not an option, and even if breastfeeding isn’t going to work out longterm, every breastfeed that any baby receives is an investment into their future health. 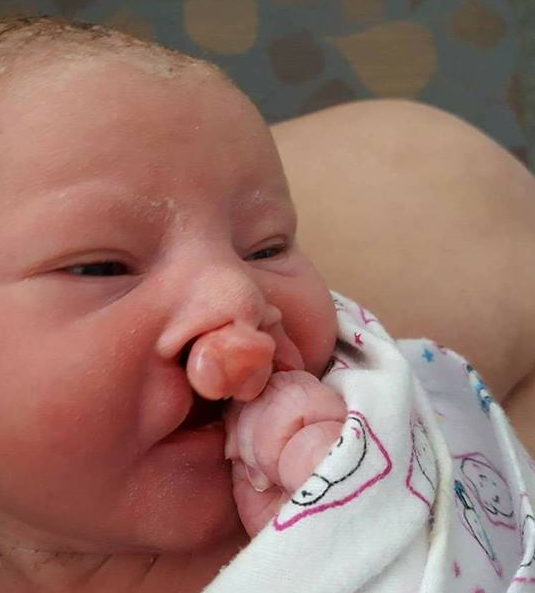 If you would like more information about breastfeeding a cleft baby, Sandy recommends Cleft Connect Australia and Cleftpals (there are several state chapters, this link is for the NSW one). The Australian Breastfeeding Association can also provide information and support. The team at Breastfeeders in Australia wish Jacinta the very best with her surgery. Thanks so much to Sandy Scholz for sharing your story with us. Please leave a positive and encouraging message for Jacinta and Sandy below, as they tackle lip repair surgery. I’m so glad Jacinta and her mom were able to have the benefits of breastfeeding. And kudos to her mom for giving it a try in the first place! what a great story. Good for her and her momma! Thank you for sharing this story! So many people are told they can’t breastfeed for different reasons…and usually there is a way! It is awesome that they were able to make it work and she was able to receive the benefits! What a beautiful little baby! I can’t even imagine the challenges that arise with breastfeeding or feeding a cleft baby. Awesome journey and story. A beautiful story. Love when you believe in the impossible and can reach your goals! What a good read. She is a beautiful little girl.